Conservation is a very important topic. This past week President Obama was up in Alaska, and he made a statement about the negative consequences of climate change. I agree that it is a very important subject, and I will do my best to adjust my lifestyle to be more environmentally friendly. The first thing I want to do is look at alternatives for my deodorant. 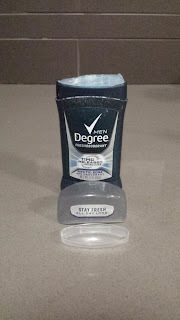 I've been using the same deodorant for along time now, and lately when I throw a used stick away, I think about how wasteful it is. The ratio of packaging to actual deodorant is pretty high. Besides what is seen in the picture below, there was also plastic that went around the 2-pack of sticks. I find this pretty wasteful, but am not going to protest it right now, because I'm not going to smell like body odor. I did look the stick over, and didn't find any recycle symbols on it. My goal for myself is to find an alternative to all of this wasteful packaging while still smelling good.